The motive to come up with this project has started by creating comfort to the spectators of the famous outdoor summer festivals in Portugal. Thousands of people with no places to seat, difficulties to get their food and drinks and security of personal belongings can be solved with this simple design. Fishing is an activity of high relevance in Portugal and the main festivals are taking place by the coast. 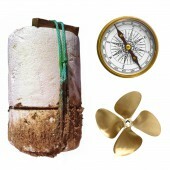 Therefore the inspiration of the Design form is the typical handcraft marking fishing buoy. This object is a transportable stool with compartments inside to carry goods. 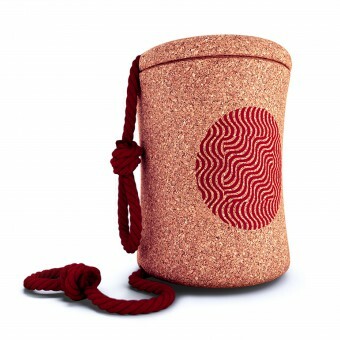 It is light, resistant, ergonomic and can be hold either as a bag or a backpack. The stool can be transported either as a backpack or a bag through a single rope that crosses the axis of the object. 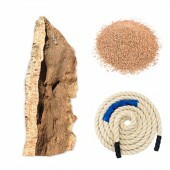 The extremities of the rope are finished with adjustable knots to fit the shoulders or the hands of the holder. When opening the lid that is closed with the rope itself, it has several compartments to store personal things like wallet, cell phones and keys or food, drinks and others. In sensory terms, it is a soft product to the touch, with a pleasant odours and a natural temperature very close to the one of the human body, reason why it conveys a unique sensation of comfort. The project started in March 2017 in Portugal West Coast and finished in August 2017 in Lisbon. 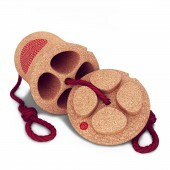 This Design is made out of Cork, an ecological material that Portugal happens to be the main exporter worldwide. It is extracted from the bark of the Oak trees without ever harming the normal development of the species. One hundred per cent natural is harvested at one hundred per cent until it is transformed to enter the productive process by grinding. The compacting result of this granulate, denominated Composite Agglomerate is today used in several products by casting it to have different kind of shapes. 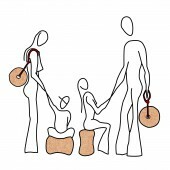 Inspired by the anatomical proportions of the Vitruvian Man by Leonardo da Vinci and Le Corbusier's Modulor, the dimensions of the object measure 35cm maximum height and 25cm maximum diameter with concave and convex surfaces to fit the anatomy of the human when transporting it or when sitting on it. One day after a company has order me to design a portable stool for outdoor festivals, I have found an old fishermen foam buoy during a low tide walk in a desert beach. It was the only object around to seat on and it was confortable by it size and it material too. In order to clean the beach and think about the possibility of designing something out of it I took it with me and due it volume, soon the idea of carving it inside to have some compartments took place. The creative challenge was to find the inside compartments form to make sense with the design concept and function. The result was the propeller shape inspiration because it can separate the inside spaces and at the same time is the structure of the bench. In terms of social perspectives it is about an ecological and multifunctional object, which simplify and bring comfort to people. It production is very feasible in Portugal because this is an abundant local material and the factories are looking forward to create new designs out of it. 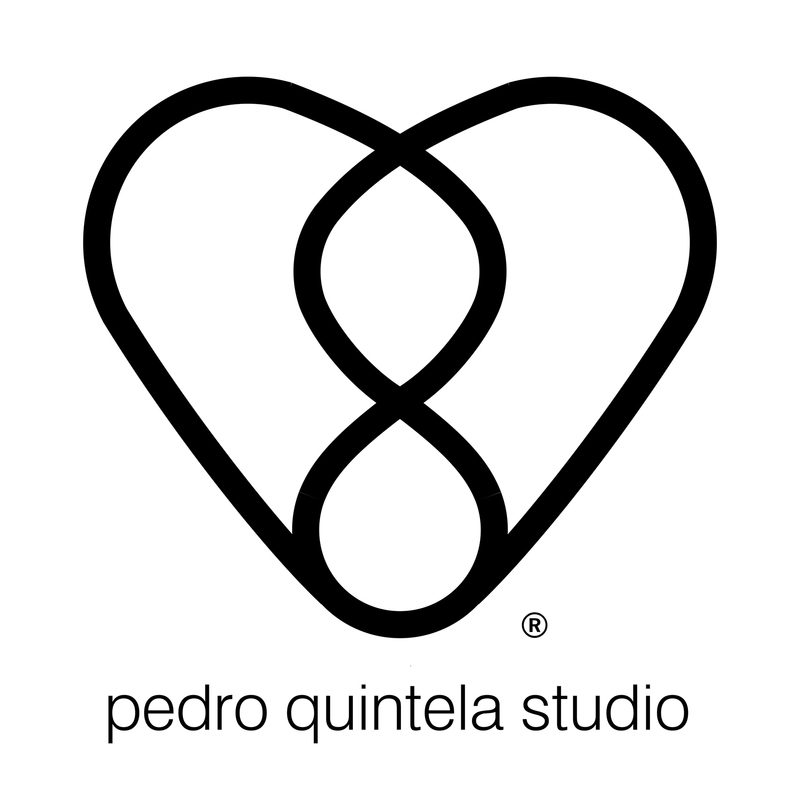 The Pedro Quintela Studio it is a platform to develop and share the work of its founder, Pedro Quintela. Architect with an assumed artistic soul, admirer of the miracle of life, time and ephemeral; witness its creativity through alchemy and harmony. Through its Holistic concept, it Design main focus its about working disorganized energies, using them, assimilating and organizing them to form a specific structure with identity, creating beauty, truth and value. The Studio is a firm believer in the art that develops as a process of evolution, as with nature, connected in three phases: adaptation (immediate response of the object to the place); transformation (reflection) and crystallization (creation). Just going through this process, the Studio considers a work to be authentic and respectful to The Spirit of the Place. Banchila Multifunctional Stool by Pedro Quintela is a Nominee in Furniture, Decorative Items and Homeware Design Category. Banchila Multifunctional Stool by Pedro Quintela is Winner in Furniture, Decorative Items and Homeware Design Category, 2017 - 2018. · Press Members: Login or Register to request an exclusive interview with Pedro Quintela. · Click here to register inorder to view the profile and other works by Pedro Quintela. Did you like Pedro Quintela's Furniture Design? Did you like Banchila Multifunctional Stool? Help us create a global awareness for good furniture design worldwide. Show your support for Pedro Quintela, the creator of great furniture design by gifting them a nomination ticket so that we could promote more of their great furniture designs.